We didn't have much in the way of cold weather and the unusual amount of rain has been beneficial to our landscapes and the aquifer. However, water will continue to be an issue in Florida and we need to be cautious of our use of it in the landscape. are in, now is the time for some drastic pruning to bring them down to size. Viburnum and Ligustrum can be pruned back by 1/3 to ½ now. This is also true for dwarf Yaupon hollies. This is a good time to shape any plants that have become leggy. Remember, Crape Myrtles do not require the drastic pruning that we so often see. They will bloom quite well with just a light pruning to remove crossing or rubbing branches and dead twigs in the interior of the plant. In fact, it is the drastic pruning that encourages many sprouts at the base of these trees. These sprouts should always be removed. There are a number of plant diseases that can be spread by pruning tools. It is best to disinfect your pruning tools after each use by dipping the cutting surfaces in a solution of one part bleach to nine parts water or rubbing alcohol (70%) from the drug store (does not require diluting). If you have a lawn service that does your pruning, ask that they disinfect their tools prior to using them in your yard. true for dwarf Yaupon hollies. This is a good time to shape any plants that have become leggy. Remember, Crape Myrtles do not require the drastic pruning that we so often see. They will bloom quite well with just a light pruning to remove crossing or rubbing branches and dead twigs in the interior of the plant. In fact, it is the drastic pruning that encourages many sprouts at the base of these trees. These sprouts should always be removed. University of Florida research on nutrient needs of lawns in Florida (You Tube http://www.youtube.com/watch?v=-Q5QOL_WU1Q) suggests that you should not apply fertilizer to lawns before April and no later than early October. So I am now recommending that you fertilize your lawns in April. Shrubs, palms and other ornamental plants can be fertilized now with a 100% slow release formula of 8-0-12 that also contains minor nutrients. Palms especially need this type of fertilizer to ward off nutrient deficiencies. Well established ornamental shrubs really only need this March fertilization each year. However, palms do need fertilization three times per year, March, late May and October. Add a fresh layer of organic mulch once all spring clean-up has been completed. Be careful to keep the mulch a couple of inches away from the base of plants and not more than two to three inches deep. You do not need to remove old mulch, just add the fresh mulch to the top. The old mulch will continue to decay and add needed nutrients to the soil. Spanish Moss or Ball Moss – Is it killing my tree? A number of people continue to ask me this question - "Is Spanish moss or ball moss killing my tree"? In short, the answer is no. 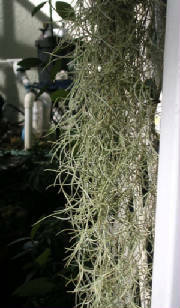 Spanish moss and ball moss are two of Florida's 16 native bromeliad species. Both are epiphytes, or air plants, that are actually related to pineapple plants. Epiphytes attach root structures to their host plant, but, they do not parasitize or take nutrients from this plant; they simply use it for support. Air plants, like most plants, make their own food through photosynthesis. If air plants become so thick that they shade the leaves of the tree, growth could be slowed down. You usually see more of these plants on weakened or damaged trees or shrubs because they also have thinner foliage. The thinning foliage allows more light into the branches, thus stimulating the growth of the air plants. So, air plants grow faster on stressed trees because the trees are weakened, but do not cause the poor tree growth. Spanish Moss (Tillandsia usneoides) is found hanging in streamers, usually from tree limbs, especially live oak and cypress. However, it can grow on most any support including shrubs, fences and trellises. It is gray when dry and light green when wet. It can hang down from tree branches in streamers up to 20 feet long. The small flowers are pale green or blue and are fragrant at night. Stems and leaves are slender and curly. Spanish moss has no roots; the leaves catch water and nutrients from moisture and dust in the air. Ball Moss (Tillandsia recurvata) is gray-green and found on tree branches or telephone wires. It is often mistaken for a small clump of Spanish moss. It grows in clumps 6-10" in diameter on most kinds of trees and other supports. The blue to violet flowers are carried on a long central stem where a one inch long seed pod soon develops. The tiny seeds are blown by the wind until they land on a tree branch where they stick fast and develop root-like attachments to the outside of the bark. Ball moss is able to convert nitrogen in air into a form that plants can use like fertilizer. Except for beans and peas, most plants cannot do this. So, when ball moss falls to the ground and decomposes, it provides a little more fertilizer for other plants. You might see one or more of the other Florida native bromeliads in trees in your landscape, especially if you live very near Brooker Creek Preserve or the other conservation areas here in the Woodlands. I have a nice specimen of one living in a bottle brush tree beside my garage that I really like. I have included a picture; it looks more like a pineapple plant than either ball moss or Spanish moss. Ten of Florida's 16 native bromeliad species are considered threatened or endangered. Increased development causing a loss of habitat, the collection of specimens from natural areas, and infestation with the non-native Mexican bromeliad weevil (Metamasis callizona) constitute the greatest threats to these natives. You might notice dead bromeliads on the ground if you are hiking in preserve areas. These have most likely died due to the Mexican bromeliad weevil.